I’ve been reading a book called The Early Christians in Their Own Words edited by Eberhard Arnold. It’s a collection of letters, book excerpts, and other writings from the first three centuries of the church’s history. Included as well, are the words of their detractors; governors, prefects and prosecutors who, at best, could not understand the new religion, at worst, sought the total destruction of every believer. It is books like this that fuel my passion for history. In it we find the personal thoughts, feelings, and meditations of people who lived and breathed nearly 2000 years ago. They, like myself, held to the belief that Jesus of Nazareth was and is the Son of God. But while for me the decision to become a Christian sometimes seems like some kind of lifestyle choice, for them it was in a very real sense a decision to die. We often lose contact with the fact that for the first generation of Christians being a believer was a death sentence. The prevailing opinion of the Romans was that these Christians were a threat to the stability of the empire. Patriotism in the empire was expressed in the worship of Caesar, the worship other gods was allowed, after all, Rome was polytheistic, but the worship of the emperor took precedence over all others. The Christians however, refused to submit to the worship of any deity but their own. This, by Roman definition, was treason, punishable by death. What frustrated and amazed the Roman authorities was the Christian capacity to ignore torture, imprisonment, and execution. They actually reveled in their situation. I’d like to tell you about one such person. His name was Vincent, from the Spanish region of Saragossa, the son of one Eutricius and his wife Enola. Raised in the church the young man impresses the local bishop, Valerius, who eventually ordained him as a deacon. Despite his young age, Valerius entrusted him with religious instruction and with most of the diocesan preaching, for the bishop himself suffered from a speech impediment. Though Christianity was technically illegal, the church was enjoying a period of being largely ignored by Rome, until the year 303. That year, the then co-emperors Diocletian and Maximian issued decrees designed to wipe out all Christian clergy. Early the next year, another decree extended the persecution to all Christians. Tens of thousands of Christians were slaughtered as a result of this renewed persecution. In Spain the anti-Christian campaign was entrusted to the Roman governor, Dacian. He proved an efficient and even sadistic executioner. Dacian decided to inspire fear in the Spanish church by first arresting Valerius and Vincent. They were imprisoned for quite some time without sufficient food and water thinking the deprivation would break them, but when they finally appeared before Dacian’s tribunal they were still so strong in body and spirit, that the governor punished his guards for failing in their duties. As was their custom, the Bishop remained silent, allowing his young deacon to speak for him. Vincent made it clear that they had been sustained by the Holy Spirit and there was nothing Dacian could do that would cause them to abandon their faith. Dacian’s anger was levelled squarely on the young man; in fact, so focussed was his anger at Vincent, he dismissed the bishop with the relatively minor sentence of exile. Vincent however, received a brutal scourging and was then stretched on the rack, in the presence of many witnesses, because Dacian wanted it to be an example for others. But neither torture nor blandishments nor threats could undermine the strength and courage of the deacon’s faith. Dacian offered to set Vincent free if he would burn a copy of his precious scriptures. The deacon responded by condemning Dacian to hell if he failed to respect the Word of God. Infuriated, Dacian ordered that Vincent be flayed alive; with much of his flesh exposed and raw, he was then roasted upon a gridiron. Of all the tortures regularly faced by the early Christians, this is the one that shakes me to the core. There is account, after account, after account of people being scourged to within an inch of their lives and then placed upon one or another iron construct suspended over hot coals and heated high enough to sear flesh – human slabs of meat literally tossed into the frying pan. And in virtually every account the victims, strengthened by the Holy Spirit, refuse to yield, in many cases continuing to praise and worship God even in the midst of pain that we can’t even begin to imagine. Vincent is no exception. According to early accounts he not only refused to abandon his faith, it is said he taunted his torturers for their inability to do get the job done. Vincent was removed from the torture chamber and thrown into a dungeon the floor of which was littered with broken pottery shards. Vincent continued to praise God and his Lord Jesus. Some reported the cell glowed as the spirit of God filled the room. Eventually, Dacian allowed friends and supporters of Vincent to move him to a proper bed and tend to his wounds. He wanted the deacon to recover enough that he would be able to face another round of torture. But God in his mercy took Vincent to be with Himself during this time, but not before he had led his jailer to faith by his courage and testimony. Surrounded by friends the valient young deacon gave up his spirit with the praise of God on his lips. It is hard for us in this day and age to fully appreciate what it meant to “come to Christ” at this time in history. For the first three centuries of the church’s history people knew even before they became Christians that to do so would likely mean a death sentence at the hands of the state. Martyrdom was not a remote possibility, it was a very great likelihood; it was part of the what it meant to believe in Jesus Christ as Lord and Saviour. I’ve thought about this a great deal and it puts the paltry sa crifices we make into perspective. The cost of our faith is small. Vincent’s story is well known throughout churches in Europe, not so much in North America. 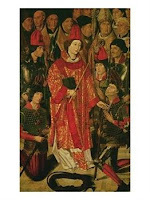 He is depicted at right in a 15th century altar-piece from Lisbon (click for larger image). Every year, on the date regarded as the anniversary of his death, special services are held in remembrance of the example he set for us all. According to that tradition, Vincent of Saragossa gave his life in the service of the Kingdom of God on January 22, 304 – 1,703 years ago this week. January 21, 1525: In a secret, illegal meeting of six men in Zurich, Conrad Grebel (Ulrich Zwingli's former protege) re-baptizes George Blaurock, a former monk. This was done in defiance of the law that required all citizens, including new-born babies, to be baptized into the Reformed Church. Grebel and his associates were of the belief that the state could not legislate religious adherence, and that baptism required a conscious decision babies were not capable of making. This meeting is considered by many to be the birth of the Anabaptist movement. January 23, 1893: Episcopal minister Phillips Brooks dies. As bishop of Massachusetts, a fervent abolitionist, frequent substitute evangelist for D.L. Moody, and the author of "O Little Town of Bethlehem," he was considered by many to be one of America's the most important preachers. January 24, 1573: John Donne is born. Who is he? The English preacher and poet who would become dean of St. Paul's Cathedral in London. He was one of the most prominent preachers of his day and one of the greatest English poets. It was he who authored such oft quoted lines as "No man is an island," "For whom does the bell toll? It tolls for thee," and "Death be not proud." January 25, 98: Upon the sudden death of Emperor Nerva, Trajan takes the throne. It is Trajan who will, two years later, ask Pliny the Younger to investigate a new superstition known as "Christianity." Even though Pliny's report considers the “cult” to be relatively harmless, it will lead to moderate persecution. It will also mark the first time Christians are recognized as being distinct from Jews. January 26, 1564: The decrees of the Council of Trent are accepted and confirmed by Pope Pius IV . A product of the Counter Reformation, the decrees improved church organization, strengthened the powers of the papacy, and blocked any chance of reconciliation with the Protestants. January 27, 1302: Dante Alighieri, after facing false charges of corruption, is heavily fined and excluded from political office permanently. He would eventually be driven out of Florence in April, after which Dante began writing The Divine Comedy, the epic poem in which he travels through hell, purgatory, and heaven. Incredible. The story of Vincent brings tears to my eyes. It humbles me to think of such evidence of the infilling of the Holy Spirit to endure such torture... and am ashamed of how little offences in comparison have so easily effected my faith. Thank you for this message, & others on the site!